A couple of weeks ago I was told about an offer that the Microsoft store had. They were selling a HP Stream 7″ tablet for £49.99. I couldn’t miss out on this so had to purchase one my self. 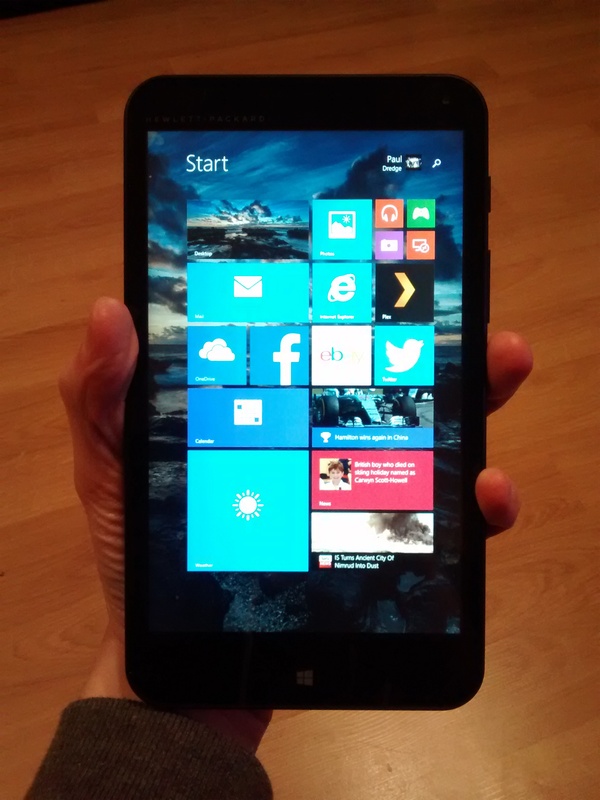 The tablet comes with Windows 8.1 Bing edition. Some people might wonder what the Bing edition of Windows 8.1 is? Well there is no real difference between the core version of Windows 8.1 and the Bing edition. Manufacturers get the Bing edition of Windows for free so they don’t have the added costs of the core edition, which means it brings the costs down of the device. The catch for the manufacturers is that the default search engine has to be Bing. Before purchasing I had read reviews that the device was quite heavy. For a 7″ tablet it is on the heavier side but I like the feel of it as it feels like you have something in your hand rather than a feather weight flimsy tablet. The size of a 7″ is great but it can be a bit fiddly at times to press on certain things using the desktop version of Windows. It does sit great in your hand and is perfect for browsing the internet and using the apps. The tablet comes with a quad core Atom 1.33Ghz processor and 1GB memory. The hard drive size on the tablet is 32GB, I was a little worried about using up that space but it also comes with a micro SD slot so you can add another 32GB. There is only a micro USB 2.0 port on the tablet but this seems to be the standard for a 7″ tablet. It charges using this USB port which I was happy about as it means I don’t have to carry around another charger. The HP Stream 7 comes with a free 1 year subscription for Office 365 personal. This gives you the advantage of using the full Office 365 package and having 1TB of space using OneDrive. This usually costs £59.99 per year. If you didn’t already know I’m a mad football fan and a keen player of the Football Manager series. To put the tablet to the test I installed the latest Football Manager game via steam and started a season. I wasn’t to disappointed at all with the performance of the game but it was a bit hard to navigate due to the touch screen being 7″ but it was playable. 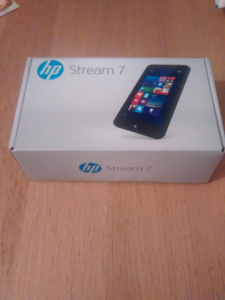 Overall I have been really impressed with the HP Stream 7 and for only £49.99 its an absolute bargain. 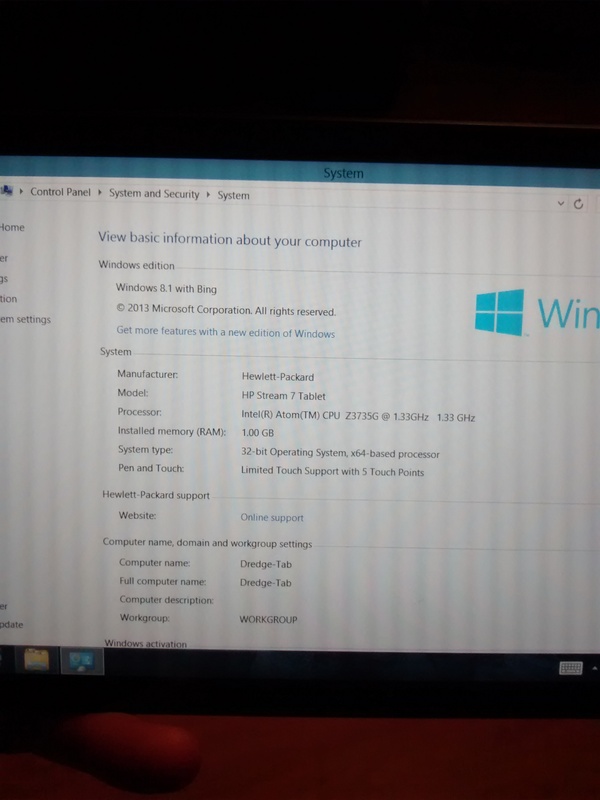 I never been the biggest fan of Windows 8.1 but on this touch device it works brilliantly. This entry was posted in Blog, Reviews and tagged #blog. Bookmark the permalink.